Full Photo Gallery is here. On Sunday evening June 26, 2011 Manhattan’s Highline Ballroom heated up for a soul revue featuring The Music of Stax Records. With the neo-soul movement in full bloom and folks intent on partying like it’s 1965, there’s no better time to turn attention to the musicians who originally forged that sound. If you hear song titles like “Soul Man”, “Green Onions” and “Dock of the Bay” you could probably sing, hum or whistle those tunes in a heartbeat. They have become part of the world’s cultural memory. If you hear the names Steve Cropper or Donald “Duck” Dunn, the response might be less automatic. In truth those tunes and so many others like “In the Midnight Hour” would not exist without those gentlemen and their cohorts of the time organist Booker T. Jones and their drummer the late Al Jackson Jr..
As The MG’s and part of the “house band” for Stax Records in Memphis Tennesee, these musicians built on the promise Elvis made ten years earlier with a mixture of country and blues that came to be known as “soul music”. It’s not the Motown kind of soul music which was quite purposefully pop in comparison. Stax stayed a lot closer to the chicken coop and while the label’s stars could spruce it up in shark skin and mohair with the best of them you always got the feeling that Wilson Picket might cut you; Diana Ross – well – probably not. The evening opened with Cropper and Dunn, working with keyboardist Lester Snell and Paul Schaefer Late Night Band drummer Anton Fig, playing some of their classic instrumentals. They effectively laid out the signature bass grooves, buzzing Hammond B3 and stinging guitar licks of “Hip-Hug-Her”, “Booker-Loo”, “Time Is Tight”, “Soul Limbo” and of course “Green Onions”. Cropper, showcasing his sparse playing style, made every note count on the melody of “Summertime”. “Duck” and Steve have been life long friends and play with an intuitive ease to prove it. It’s all done with an almost imperceptible nod, a half smile, or sometimes a bemused stare. It’s fun to watch these guys having fun. When singer Eddie Floyd was introduced to the stage and launched into “Raise A Hand” the show shifted to high gear. Just one day past his 74th birthday Floyd was a dynamo traversing the stage continuously, working up a sweat and pulling pretty ladies out of the audience to dance with him. The audience responded in kind, and quickly got on their feet dancing along to classic tunes like “Knock On Wood” and “634-5789 (Soulsville USA)”, both authored by Floyd. “On A Saturday Night” had the audience singing along oblivious to the fact that it was really a “school night”. As expected set ender “Soul Man” blew the lid off the place. Current recognition of the Stax label’s monumental contribution music can be traced in part to the continued success of Dan Ackroyd and John Belushi’s “The Blues Brothers”. A loving and hilarious homage to the music they loved. “It’s always on cable TV” Cropper noted. “New” Blues Brothers joined Floyd on stage for this number, trading lead lines, mock boxing and ultimately genuflecting to kiss the ring of the soul pontif. The band gifted the Highline crowd with a surprise performance of “Dock of the Bay” as the encore; the posthumously released Otis Redding song apparently one that Floyd had declined to cover. But, with a pinch of “Fa Fa Fa Fa Fa (Sad Song)” thrown in for spice it turned into a fitting and respectful remembrance and closed the show with the audience whistling its plaintive refrain. 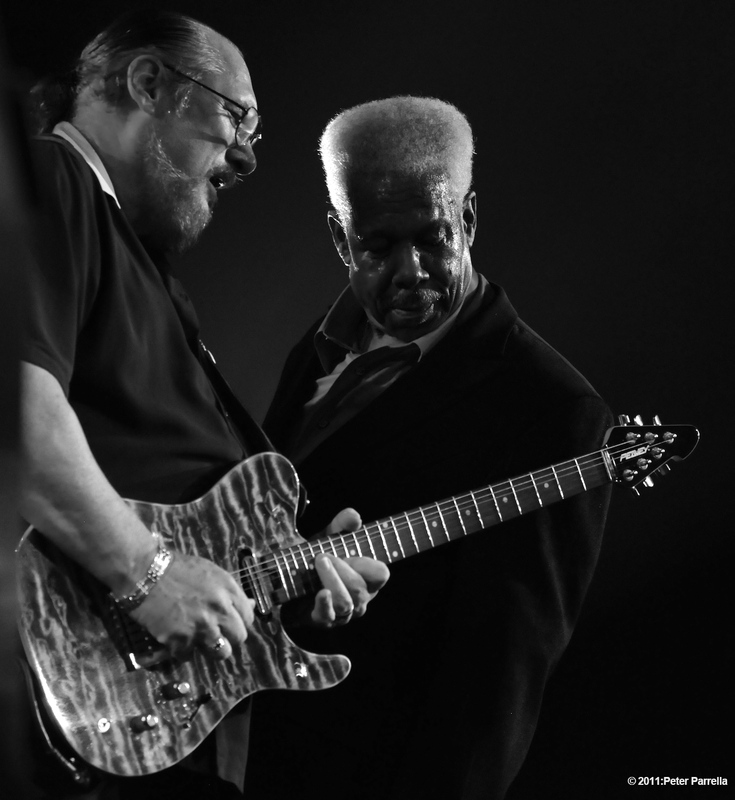 Steve Cropper’s new album titled “Dedicated” is due for release in early August. It’s a salute to the music of early R&B group The “5” Royales and guitarist Pete Pauling. The star studded CD includes performances by Steve Winwood, Bettye Lavette, Sharon Jones, Brian May, Delbert McClinton Spooner Oldham, B B King, Lucinda Williams, Steve Jordan. Promises to be an exceptional listen. Pre-order link is below.